The evangelical emphasis or movement really began in England during the mid-eighteenth century with the ministries of such leaders as George Whitefield and John and Charles Wesley. The movement in its earliest days reached mainly the lower and middle classes of society with the upper classes remaining quite aloof from its influence. During the nineteenth century, however, the evangelical movement began to have considerable influence upon the upper classes as well. One such influential group was known as the Clapham Sect because the activities of this group centered in the elite suburb of Clapham in Southwest London. These men were wealthy evangelical philanthropists, students of the Bible, and men of prayer. They gave freely of their time, talents, and money to spread the gospel. Though these individuals generally maintained their membership within the Anglican Church, their emphasis was always on the necessity of personal conversion and guidance by the Holy Spirit rather than on a mere reliance upon the sacraments and rituals of the Church. There are numerous examples of the zealous ministries carried on by these influential Christian laymen, including a number of members of Parliament, who exercised great compassion upon the masses of impoverished people throughout the United Kingdom. A noted historian says of this Clapham Sect, "Never in the history of Anglicanism had any group exercised so profound an influence." Katherine Hankey was born in 1834, the daughter of a wealthy English banker. Though the members of her family were prominent members of the Anglican Church, they were always associated with its more evangelical faction. Her father was one of the influential members of the Clapham Sect. Early in life Katherine, or Kate, as she was affectionately known, caught this same evangelical concern from her father. She began organizing Sunday school classes for rich and poor throughout London. These classes had a profound influence throughout the city with a large number of the young students in turn becoming zealous Christian workers. Kate also did considerable writing, including such works as Bible Class Teachings, a booklet on confirmation, as well as a number of books of verse. All of the royalties received from these publications were always directed to some foreign missions project. When Katherine was only thirty years of age, she experienced a serious illness. During a long period of recovery she wrote a lengthy poem on the life of Christ. The poem consisted of two main sections, each containing fifty verses. The first section of the poem was entitled "The Story Wanted," It was from this part of her poem that she later adapted the words for another of her familiar hymn texts, "Tell Me the Old, Old Story." This hymn has since become another of the church's classic children's hymns. Later that same year while still recovering from her illness, Kate Han-key completed the second part of her poem on the life of Christ. This sequel to the first section was entitled "The Story Told." From these verses came the text for "I Love to Tell the Story," written in the same meter but with a different accent than her other familiar hymn text. Being musically inclined, Kate also composed her own tunes for these two texts. Her hymns received little notice, however, when used with this music. The following year, 1867, a large international YMCA convention was held in Montreal, Canada. One of the speakers at the convention, Major General Russell from England, closed his emotionally charged message to the delegates by quoting the verses from Miss Hankey's two hymn texts. In the audience that day was a noted American gospel musician, William H. Doane, composer of more than 2,000 gospel songs. Mr. Doane was greatly moved by these lines and promptly composed musical settings for both texts. Later a new musical setting, which replaced Doane's music for "I Love to Tell the Story," was composed by William G. Fischer, a Philadelphia musician and piano dealer. Fischer also added the refrain for the hymn, "I love to tell the story! Twill be my theme in glory-to tell the old, old story of Jesus and His love.'' 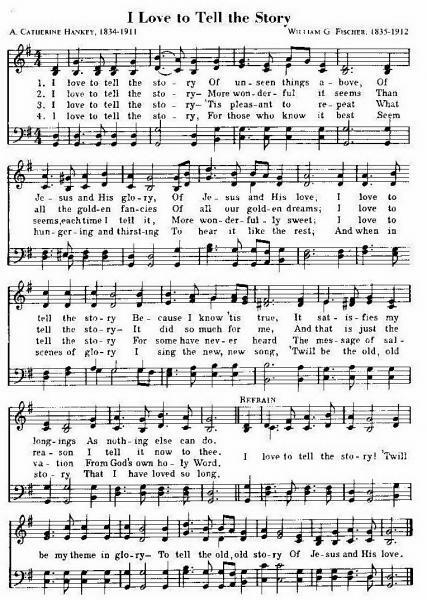 In 1875 the hymn appeared in its present form in Bliss and Sankey's collection, Gospel Hymns and Sacred Songs, which brought "I Love to Tell the Story" to the attention of evangelical congregations everywhere. Both of Katherine Hankey's hymns are still widely used today.